The Jumanji board game can be played by 2 to 4 players. It’s recommended for players aged 8 and above. 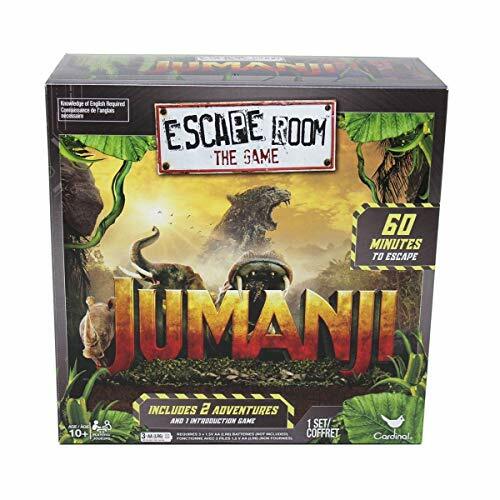 Based on the famous 1995 film ‘Jumanji,’ this game is chiefly determined by the chance roll of dice that sets the players out on a deadly journey. 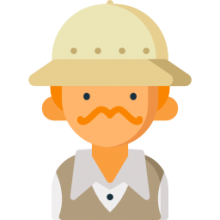 Be it decoding rhyming messages that may spell a disaster, saving a fellow player in danger, or the players losing if the jungle overtakes them before they can finish the game and escape, the various suspenseful possibilities and the game’s adventurous theme make Jumanji extremely fun to play. A game for those who seek to find...a way to leave their world behind. Decipher the codes that will set you free in the Jumanji Escape Room Game! Enter the correct keys into the Chrono Decoder to advance in the game. Board measures 14 x 14"
In 1995, Jumanji – the movie, was released, which was based on a 1981 picture book written and illustrated by Chris Van Allsburg. The focal theme of the movie was a deadly board game that would bring the jungle and its residents alive into the players’ lives. Once the play is started, the players can’t quit the game and have to complete it, or else, the mayhem and madness won’t come to an end. 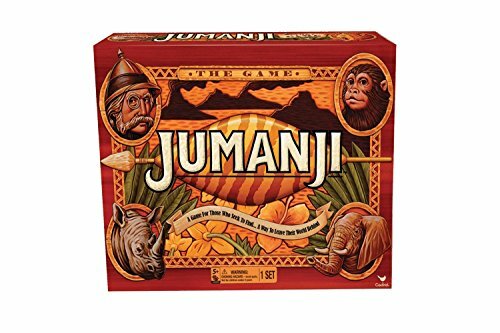 Based on this movie, Jumanji board game was originally published in 1995 by MB Spiele in Germany and Milton Bradley in the US. 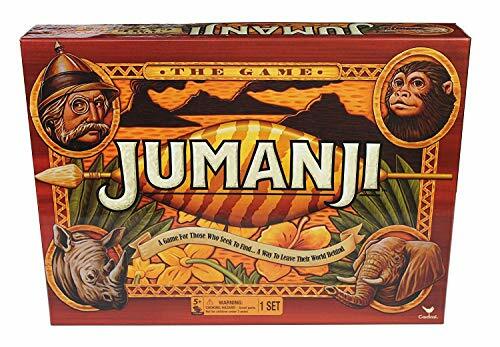 Jumanji board game original game box had the title of ‘Jumanji’ inscribed on top, under which the 1995 film’s tagline was featured that indicated the game was meant for those looking for a way to leave their world behind. The gameboard shows four winding paths with a Jumanji decoder placed in the center. Doomsday Grid, which has 10 places for ‘jungle releases,’ is on one side of this central playing region. In case these places get filled before a player wins the game, everyone loses. The other side of the board marks positions where you should set the draw and remove the pile of danger cards. Once you have set the decoder at the center of the gameboard, let every player select a pawn, and put it at the matching color ‘start’ point. The rhino figure should be placed at its home base. Every player should also select a rescue die and put the rest away. The player who begins the game gets the timer and rolls the die. He/She then moves his/her pawn along the marked path toward the gameboard center by moving the same number of spaces as shown by the face of the die. The timer and the numbered die are then passed on to the player on the left. On your turn, you have to follow the space directions after rolling the die. There are four types of spaces in this game, namely Blank Spaces, Jungle Spaces, Rhino Spaces, and Wait for 5 or 8 Spaces. What you will do next would depend on what kind of space you have landed upon. You can get details on Jumanji board game – how to play at the gaming community of Twinfinite. The player to reach the gameboard center first and yell ‘Jumanji’ wins the game. You can reach the gameboard center either by exact die count after you have rolled the number die on your turn, or on a fellow player’s turn, by exact number count after you have moved ahead on a danger card. In case the card or die number is less than the spaces you need to arrive at the center, move your pawn the number of spaces as displayed on them. In case the card or die number is more than the spaces you need to arrive at the center, keep your pawn where it is. If it’s your turn, follow the instructions for the space you are on. Though more than one player can arrive at the gameboard center on the same turn, the winner is the one who calls out loud ‘Jumanji’ first. You can know more about Jumanji board game rules at Hasbro. There was also a TV series- below is the first season episode list. You can get the full episode list by visiting Wikipedia. Though Jumanji – the movie, came out more than 20 years ago, it still has a special place in the hearts of many as it evokes their childhood memories. If you want to add to your movie collection or just want to get your hands on the replica of the original game that came in a beautifully carved wooden board, you should buy the custom-made, screen-accurate replica of the original Jumanji board game. With a magnificent hardwood gameboard with professionally carved pieces that come packed in a casing having a solid woodwork finish similar to the movie casing, the Jumanji board game replica is sure to delight both fans of the board game as well as the movie. While some people who have bought the game through various platforms praise it for its easy yet interesting gameplay, some others say the game is bland and doesn’t challenge the players. While a majority agree on the pros like the integration of the motion picture ideas into the board game, the game’s components, and the beautiful artwork its game pieces and the board showcase, many adults say the lack of challenge is a big downer for them. Yet, there’s no argument that the game is a winner for kids. In 2017, Jumanji: Welcome to the Jungle, a new take on the 1995 film, was released where the four main Jumanji characters were video game avatars. Cardinal Games reproduced the original board game with new artwork to coincide with the film’s release. With the aim of capitalizing on the 2017 film, this re-release had some changes in the riddle message texts on the danger cards, particularly the unique danger messages. 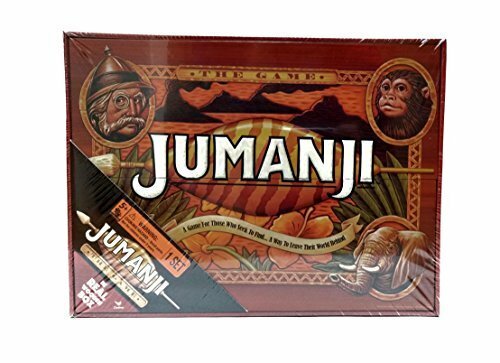 A special Jumanji board game wooden edition was made available by Cardinal Games that replicated the 1995 film’s folding lid edition of the board game.